One of the most rewarding aspects of homeschooling is the ability to tailor your child’s education specifically to their needs. It’s the reason many families choose to homeschool in the first place! Whether it’s due to special need or a simply a desire for more flexibility, it’s wonderful to be able to choose what works for you and what doesn’t. Have you heard of love languages? Consider learning styles in the same light. We each see things through our own lens, and it takes some time to figure out that not everyone sees and receives things in the same way we do. As homeschool teachers, we gravitate towards curriculum and teaching methods that fit our own style of learning. If you happen to have a child who learns in the way you do, that’s great. However, you are up for some real challenges if not. The goal is for your child to be comfortable with each style of receiving information. That is what will set them up for success long term. Knowing your child’s learning style can help you choose the best way to present challenging new information. You can introduce other styles of learning when it comes to topics your child has already begun to master. The other benefit to figuring out learning styles is that you can cater your teaching style in a way that benefits the child. 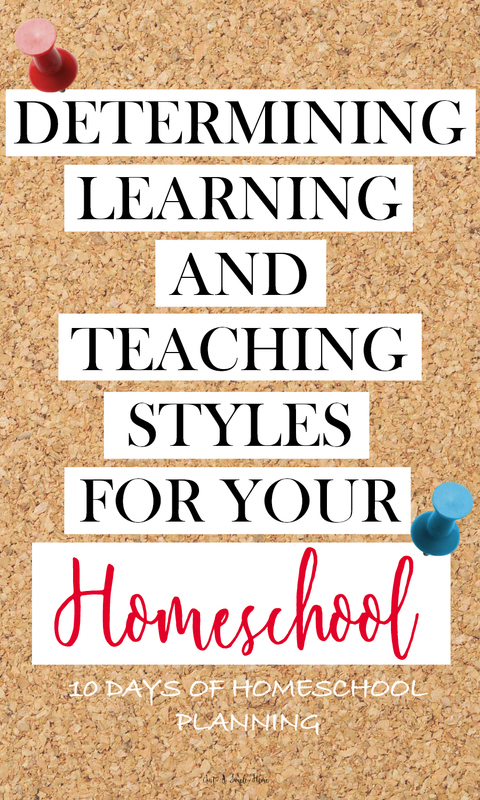 I know my learning style, and my teaching style is quite the same…and when we started homeschooling, I had a rude awakening when I realized my children don’t learn the way I do, and therefore I was the one who needed an adjustment. You can figure out your child’s learning style from a variety of things, and some will depend on the age of your child. If you have been homeschooling for some time, you likely already have an idea of what methods work and which ones don’t. Pay attention to your child…in a way that will help you determine how they respond to activities, challenges, new situations. As a parent, you likely know if your child is one who likes to talk about their problems, or prefers to inwardly reflect. Do they easily remember things they are told, or can they tell you what a book says word for word? If your child prefers to listen to instructions, you may have an auditory learner. Do they easily remember oral directions, and respond well when you ask them something outloud? They may prefer audiobooks or listening to you read, they may read more slowly to themselves, and get distracted by doing so. They are natural listeners, and do well working through ideas via discussions rather than written work. Auditory learners should be encouraged to pay attention to details of visual information, since that is not what comes naturally to them. Kinesthetic learning or tactile learning is a learning style in which learning takes place by the students carrying out physical activities, rather than listening to a lecture or watching demonstrations. If your child learns through movement or by “doing” then you likely have a kinesthetic learner. Tactile learners are driven by their sense of touch. They are often very active, constantly moving and physically expressive. They are great at taking things apart and putting them back together. They might struggle with listening to directions and with remembering smaller parts of a longer project. Tactile learners should be encouraged to practice repeating oral information and create visual tools. Visual learners typically have a great memory and a natural sense of direction. They think in pictures or facts they read about and have difficulty with oral instruction. They learn best using drawing as a tool, charts, mindmaps and graphic organizers. They prefer reading on their own instead of being read to. They likely are readers and can remember great visual details. They may be more of a “let me look at it myself” kind of person. Visual learners should be encouraged to consider abstract concepts. What kind of learner do you have? I have one of each, so far, with more to come. Some of my children overlap in their learning styles, which adds another dimension to teaching. However, I really appreciate know each child’s learning style so that I can teach to their strengths and also work on their weaknesses. I can foster one style while giving them tools to help them learn independently in the future. What is YOUR Teaching Style? Now…consider what your learning style is, too. Not only is it interesting to fins out how you learn, but it is also extremely important in the way you teach. You just determine your child’s learning style and now you need to find a way to mesh yours with theirs. It can help you be a more effective and understanding teacher. I know I am more of a visual learner and have a hard time with my spatial and auditory learners. But I have learned methods and tricks that help me teach and relate to them in ways I otherwise might not have known. DON’T FORGET…THIS IS PART OF A 10 DAY SERIES I AM DOING WITH 15 OTHER BLOGGERS, SO GO CHECK THEM OUT! Wow Terryn, I’ve never even considered this. The first sentence “homeschooling is the ability to tailor your child’s education specifically to their needs” grabbed me. I’ve never even considered homeschooling. My child is one and a half. Thank you for this. I just think I won’t have the patience for it BUT I know my husband will. He’s already a SAHD and tells me daily what he and our 18-month-old got up to. I homeschooled my daughter for high school because she had some learning disabilities and her school wasn’t helping her succeed. The difference was night and day to be able to create an environment tailored specifically to how she learned best! This is such a great resource! I sooo needed this today! We start our first year of homeschool next month and I have been so excited but nervous as we get started. Thank you for the insight! I am so excited for you! This is only the second day in a 10 day series, so make sure to come back! And visit the other bloggers too, there’s so much info being shared!